The new movie portrays a female shark who attacks with a vengeance. But who's the real victim? "The Shallows" may be causing a summer box office feeding frenzy, but its portrayal of a great white shark and surfer protagonist are strictly fiction. In fact, according to data reported in Marine Policy and elsewhere, in the time that a viewer watches the 1 hour and 27-minute movie, about 17,125 sharks will be killed worldwide. That means an estimated 100 million to 273 million sharks are killed both directly and indirectly by humans each year, so when it comes to human-shark interactions, sharks are nearly always the victims. "The Shallows" tries to add a victim element to its great white, given that the female shark has a painful-looking hook in her mouth, but star Blake Lively's character, Nancy Adams, is in the primary hero survivor role. Photo: Nancy (Blake Lively) in Columbia Pictures' "The Shallows." Credit: Vince Valitutti @2016 CTMG, Inc.
"Years ago, summer thrillers featured aliens from outer space as the bad guys, but that became too ridiculous," Marie Levine, founder and executive director of the Shark Research Institute, told Discovery News. "I remember one film where the alien looked like a tomato soup can." "Then such films featured ants and spiders, and now, after "Jaws," sharks are often the antagonists," she added. "Jaws" was a game changer that led to this whole new genre of summer thrillers. Ryan Orgera, a researcher formerly with Monmouth University, told Discovery News, "No moment in American history is more important to shark-human interactions than the 1975 release of 'Jaws.' Steven Spielberg's film portrayed great white sharks as indiscriminate, even vindictive man-eaters." "The film and Benchley's novel did so much to undo the progress that Jacques Cousteau and others had made on behalf of sharks. 'Jaws' was the first true nationwide film release. For the first time for many viewers, especially in America's heartland, the ocean became a source of terror, and sharks became the most rueful creatures in the sea. It is hard to overstate the damage to the shark's image that 'Jaws' created." "The Shallows" follows the basic shark-versus-human premise. Nancy surfs on a beautiful secluded beach, finds herself in the "feeding ground" of a great white, and escapes to a rock, where she spends much of the movie. "Though she is stranded only 200 yards from shore, survival proves to be the ultimate test of wills, requiring all of Nancy's ingenuity, resourcefulness, and fortitude," reads the "wraps" for the film released by Columbia Pictures. It is hard to believe that Nancy has ingenuity, given that she goes surfing -- alone -- wearing plenty of glittery bling (earrings, necklaces, bracelets, rings). NOAA Fisheries Service has long offered this advice to recreational water users: "Don't wear shiny jewelry when in the water. The glisten mimics fish scale sheen and visually labels you as shark prey." The shark in the movie was mostly created via CGI, but Lively told Entertainment Weekly that "they had a guy with a great white sized fin attached and he would swim around on like a little sea doo, like an underwater rocket propeller." Executive Producer Jaume Collet-Serra teamed with a studio art department for the design of the shark. "I came to the conclusion that the shark had to be a female," Collet-Serra said. "Females are slightly bigger, and most have great scars from mating. Visually, they're scarier, as they are more protective." As Levine said, "Female great whites are definitely not any more protective than males are because their young are precocial and are not protected by their mothers." Scott E. Anderson, the film's visual effects supervisor, says the shark attacks Nancy early in the movie. "And after the shark has wounded her, the shark just thinks of Nancy as food," Anderson said. That may be true of Anderson's fictional shark, but humans are not preferred prey for great whites, which primarily eat marine dwellers such as fish and sea lions. While sharks have extremely keen senses and can detect blood from a quarter of a mile away, blood is not necessarily a dinner bell for them. For example, according to Steve Kajiura of Florida Atlantic University's Shark Lab, there is no evidence that sharks attack menstruating women more than other people. Lively said that, because the shark was previously hunted by people, "You then understand the shark's motive, his determination, his will, his desperation to conquer as his survival also depends on it." The shark, which is actually depicted as a female in the film, would likely not act out of anger or revenge. Psychologist Ryan Martin of the University of Wisconsin-Green Bay wrote in his blog, "It's probably unreasonable to say that a shark can feel wronged, unfairly treated, or even have the capacity to blame someone for something." "The Shallows" does get some things right. Anderson said that the basis of the film's research library consisted of "little moments that Jaume liked" about general actions and behaviors of sharks. There is a seagull in the film that was injured by a shark, and it is true that sharks do at times attack seabirds. At one point, Nancy estimates the great white's swimming speed. 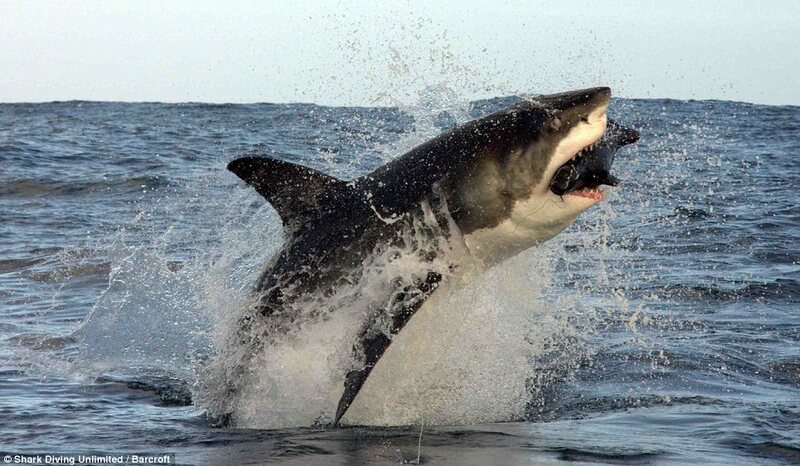 Most experts do believe that sharks can swim 25–35 miles per hour. In another pivotal moment in the film, the shark bites through metal, which has been reported. In yet another scene, the shark leaps out of the water to attack, a move that has also been documented. Photo: Nancy (Blake Lively) on the set of Columbia Pictures' "The Shallows." Credit: Vince Valitutti @2016 CTMG, Inc. The film really goes off the deep end, however, with the number of deadly shark attacks that it portrays. Three times more people die of shark attack in the movie than are killed by sharks annually, on average, in the entire United States. The press kit for the movie says Lively had one personal great white shark diving experience in 2010, when she traveled to Gansbaai, South Africa. Levine, on the other hand, has researched sharks for decades and is a member of the Women Divers Hall of Fame. This shark conservationist is a far cry from Lively's character Nancy, whose performance "mostly consists of screaming in agony" as she performs emergency surgery using jewelry on a "nasty flap of thigh meat that has been all but torn away," The Washington Post review of the film concludes. In contrast, Levine says, "I have been a surfer and diver for over 40 years and I have never felt threatened by a shark."